Have you ever wondered why you just can’t find a good sieve maker these days? As well, why you can’t find a top-notch cloggist? Handcrafting skills are vanishing, fast. Well, you are not alone in your wondering. The British Heritage Crafts Association just published a study that finds some sixty-two traditional handcrafting skills are in danger of being lost. Four, of the list, cricket ball sewing, gold beating, lacrosse stick making and sieve making, have already become extinct. 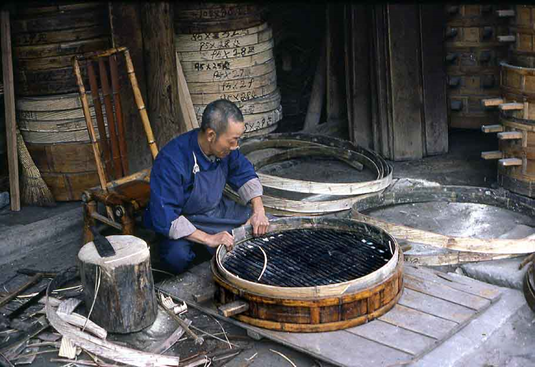 Among the crafts on life support are the making of parchment, saws, hat blocks, clogs, fans, coaches and pianos. The report suggests a number of reasons for the decline. A lack of training opportunities is one reason these traditional occupations are vanishing; an aging work force, competition from manufactured goods and a lack of government support are also at fault. Hold it a minute. Isn’t there the fact that time has passed some occupations by? Why should we preserve the skills of the coach maker when no one who is anyone uses a coach and four anymore? We need to train people to make self-driving cars, not obsolete objects used only by entitled royals. Well, the principal researcher of the said report has a defence for that. “We don’t necessarily expect all of our heritage buildings to justify themselves financially….We recognize biodiversity as part of our natural heritage ... and we’re thinking of these craft skills as part of our intangible cultural heritage,” says Greta Bertram. She has a point. Yet, has she missed another argument in her favour. As implausible as it seems, suppose an oafish dotard was to take the reins of a nuclear power and act on that power? Wouldn’t the increased risk of an apocalypse suggest that, when it arrives and we find ourselves without ready access to power, clean water and Kentucky Fried Chicken, some pre-industrial skills would become valuable; perhaps even vital? Moreover, just think of the business the sieve maker could get from Jumblies. “Intangible cultural heritage” is an interesting phrase. The phrase “intangible cultural heritage,” as used by Ms. Bertram, was new to me. Did you hear about that moon landing, by the way? “Intangible cultural heritage” is defined by the source of all knowledge, Wikipedia, as “the practices, representations, expressions, as well as the knowledge and skills (including instruments, objects, artifacts, cultural spaces), that communities, groups and, in some cases, individuals recognise as part of their cultural heritage.” Lurking beneath those bland words is a bit of a political divide. Some 170 countries have adopted a 2003 UNESCO Convention for the Safeguarding of Intangible Cultural Heritage. Britain, Canada and the US have not. Perhaps they don’t want some pipsqueak UNESCO-crat, from Peru, telling them that supporting a professional football event like the Grey Cup is a barbaric intangible cultural practice and must stop and that the money spent instead to support Inuit throat singing. Whether we care to admit it or not, our bureaucrats have a heavy stake in deciding with Intangible Cultural Practices survive and which ones die out. The money to support Canada Day, for example, does not grow on trees, or come entirely from the pockets of County taxpayers. The big question is this, does Wellington have something to contribute to Canada’s intangible cultural heritage. You’re darned tootin’ it does! I need not consult my diary more than a week and a half ahead to when our annual Pumpkinfest begins, hopefully with the same kind of weather we’ve been enjoying this week. Wellington is the community that does the best job in the world of parading our giant pumpkins down Main Street and then weighing them off and declaring a winner. That is just one local contribution to our intangible cultural heritage; there are doubtless others. Not everything Pumpkinfest has ever done has succeeded. The giant pumpkin tossing contest, scheduled several years ago, was cancelled at the last minute after several would-be contestants reported suffering hernias during training. That minor glitch aside, I think Wellington residents should be proud to know that they are not just enjoying a local festival; they are contributing to the perpetuation of one of Canada’s major events forming part of our intangible cultural heritage. Pie making is not an endangered line of work. After that mouthful, I think I need some tangible cultural property such as, oh, a piece of pumpkin pie. I am confident pie-making is not an endangered skill here in the County - unless I want the flour in my crust to be sifted through a handmade sieve, in which case I’d probably have to make it myself and go looking for my sieve in a museum.